There is no denying that blood transfusion is an important part of modern medicine. In a good number of cases, the whole blood need not be given but rather a component of blood can be given. This allows the same blood to be given as components to different recipients as required. The ability to transfuse blood or its components is lifesaving in most cases. Bloodborne infections such as HIV, Hepatitis B and C etc. are routinely tested in the lab before the transfusion. As per the current guidelines, blood and blood-derived products (BBDP) are tested for a set of microbial agents which are thought to be pathogenic and transfusion- transfusible. There is a debate on if we are testing enough. For example, testing strategies currently use an immunology-based assay for detection of signatures related to infections and that is not as sensitive as genetic tests. There are many other region specific infections such as Ebola and Zika virus (especially since certain carriers are asymptomatic) which can be transmitted by blood for which routine testing is not done. We are not even aware of every possible range of organisms that can be transmitted, let alone test. In an ideal case, the BBDP should be free of any microbial component. However, such a scenario is unlikely. Just as many other body fluids have been shown to be non-sterile, blood is also shown to have a good number of microbiome associated with it. Most of the microbiome papers are actually bacteriome papers. Bacteriome papers are much more common in literature since it involves sequencing of 16s rRNA and it is much easier to do. In similar lines, mycobiome can be done, since it involves sequencing a particular target. In contrast, there is no common targetable gene or region of the genome for viruses and the only viable approach for studying virome is to do whole genome sequencing. Human virome has been published heavily for skin and gut and the major findings have been bacteriophages of various types. Blood virome is thus an interesting study that looks into what viruses are there in blood and are we testing enough. In 2003, a proposal was made to develop a global system to catalog viruses and detect emerging diseases throughout the world. The idea was to routinely screen human blood to identify and monitor viruses from human samples. The core of the proposal was to collect blood from hospitals and labs weekly. This would be followed by extraction and sequencing of the viral genomes. Once a database of viruses is constructed, researchers could use it to screen for new viruses as they appear in the population. Such a database was supposed to help in quick identification of emerging infections and identify novel viruses. A multi-group collaboration involving Dr. J Craig Venter (recipient of De Leeuwenhoek Medal 2015) who has been recognized for developing several generic findings by sequencing technologies has now published a paper on human blood virome from Human Longevity Inc. To put the study in a nutshell they sequenced genomes of 8,240 individuals who were all essentially healthy and not infected with anything. The majority of the reads were mapped to the human reference genome. Roughly 0.2% was attributed to bacteria and 0.01% to viruses. 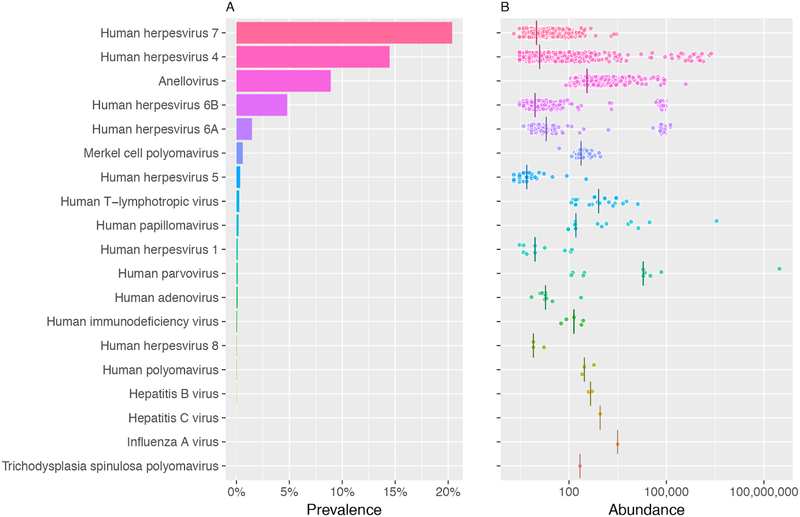 Fig 1 shows a summary of the percentage of individuals presenting with viral sequences. It was not surprising to see a variety of human herpes virus, but there were many other viruses some of which are related to humans and many bacteriophages. It must be noted that this study was designed to look for DNA viruses and there would be much more in the data if RNA-related virome reads can be obtained. The study is important since it kind of establishes what is a normal virome. Novel genomes were not reported in the paper. As the paper concludes "The study was not conceived for the discovery of highly divergent, novel human viruses, as this requires the use of less stringent similarity criteria for detecting divergent (relative to those already known) viral sequences." Moustafa A, Xie C, Kirkness E, Biggs W, Wong E, Turpaz Y et al. The blood DNA virome in 8,000 humans. PLOS Pathogens. 2017;13(3):e1006292. Table 1: Known mechanisms of colistin resistance. MCR-1 a plasmid mediated resistance gene has been extensively discussed on this blog previously. Ever since its first report, a lot of research papers have come from the topic. There is hardly a country where genomic surveillance tools are available and MCR-1 is not reported. The location of the gene on a plasmid makes it more devastating. It is indeed very interesting to note that the MCR-1 is not just located in one plasmid. Many different plasmids have been demonstrated to be capable of harbouring MCR-1 and hence it should be inferred that it is widely distributed. It should be noted that the colistin resistance can be caused by several factors. Table 1 is a compiled list of colistin resistance determinants. The crystal structure of MCR-1 is already published and a good lot of information is available about the domain. The crystal structure study showed that MCR-1 possess a α-β-α-sandwiched structure and coordinate divalent zinc ions in the active site via phosphorylation of the conserved residue threonine. The nucleophile for catalysis is threonine 285 (Phosphorylated). They are most homologous to LptA and EptC transferases in terms of the sequence. What is most interesting is that MCR variants are now being described. In a surveillance study at Belgium, 92 porcine and bovine colistin-resistant E coli isolates that were negative for MCR-1 was identified. Of these randomly selected 10 isolates, plasmid sequencing was done and 3 of the 10 showed sequence later designated as MCR-2 gene, which was 1,617 bp long, nine bases shorter than mcr-1(1,626 bp), and showed 76.75% identity. In 2016 august, a group from Italy described a novel MCR variant, named MCR-1.2, from an MDR KPC-producing K pneumoniae strain belonging to sequence type 512. This strain (KP-6884) was isolated in 2014 from a rectal surveillance swab obtained from an Italian child admitted to the paediatric onco hematology ward of Pisa University Hospital. Fig 2: Sequence comparison of MCR and its variants. Most recently another MCR-1 gene variant, referred as MCR-1.3 carried is reported from a colistin-resistant S. Typhimurium strain YL14P053, which was isolated in 2014 from a rectal swab from a 46 years old healthy woman who received a medical examination in the Yulin Center for Disease Control and Prevention. It is a little confusing to me that the news and press release article mentions this variant as an MCR 1.6 whereas in the paper it says MCR 1.3. Fig 2 shows the alignment of MCR-1 gene with its variants are shown. 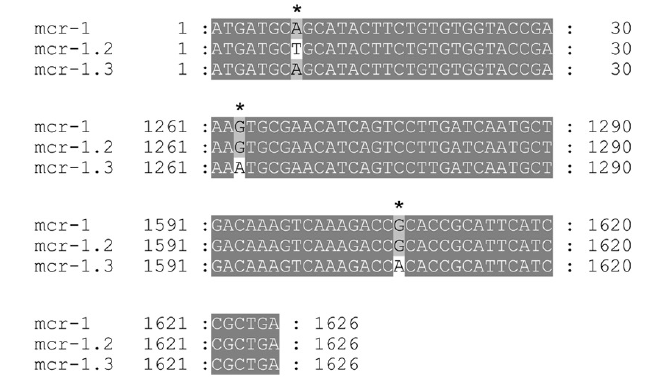 MCR-1.2 has a variation at the nucleotide position 8, A was mutated to T, leading to a Gln to Leu change in amino acid position 3; MCR-1.3 has a variation in nucleotide position 1263, G was mutated to A, which is a synonymous mutation, while in nucleotide position 1607, G was mutated to A, leading to an Arg to His change in amino acid position 536. Corresponding author Biao Kan comments, "This is the first time a mcr-1 gene has been found in Salmonella in a healthy carrier. Healthy carriers play an important role in the transmission of resistance genes to the community. Salmonella infections have been the leading cause of foodborne illness, and Salmonella-carrying mcr-1 will likely be a problem in food safety". It occurs to me that the MCR gene and its variants have been found in several scenarios where there is no colistin pressure. That means evolutionarily there is no great fitness cost in keeping it, further suggesting that losing this plasmid would be a common feature once acquired. Just like there are several NDM types and variants after the original discovery of NDM-1, am sure we are going to have several types of MCR-2. If we start whole genome sequencing of every colistin resistant isolate we are going to definitely get a lot of variants and maybe more types. Or who knows, something totally novel. Olaitan A, Morand S, Rolain J. Mechanisms of polymyxin resistance: acquired and intrinsic resistance in bacteria. Frontiers in Microbiology. 2014;5. Ye H, Li Y, Li Z, Gao R, Zhang H, Wen R et al. Diversifiedmcr-1-Harbouring Plasmid Reservoirs Confer Resistance to Colistin in Human Gut Microbiota. mBio. 2016;7(2):e00177-16. Stojanoski V, Sankaran B, Prasad B, Poirel L, Nordmann P, Palzkill T. Structure of the catalytic domain of the colistin resistance enzyme MCR-1. BMC Biology. 2016;14(1). Hu M, Guo J, Cheng Q, Yang Z, Chan E, Chen S et al. Crystal Structure of Escherichia coli originated MCR-1, a phosphoethanolamine transferase for Colistin Resistance. Scientific Reports. 2016;6(1). Di Pilato V, Arena F, Tascini C, Cannatelli A, Henrici De Angelis L, Fortunato S et al. mcr-1.2, a New mcr Variant Carried on a Transferable Plasmid from a Colistin-Resistant KPC Carbapenemase-Producing Klebsiella pneumoniae Strain of Sequence Type 512. Antimicrobial Agents and Chemotherapy. 2016;60(9):5612-5615. Lu X, Hu Y, Luo M, Zhou H, Wang X, Du Y et al. MCR-1.3: a new MCR variant carried by an IncP plasmid in a colistin-resistant Salmonella enterica serovar Typhimurium isolated from a healthy individual. Antimicrobial Agents and Chemotherapy. 2017;:AAC.02632-16. I have previously mentioned in my several earlier posts that there is a growing concern for antibiotic reistance and new antibiotics needs to be brought into clinical picture. The picture is complicated by several companies not investing sufficiently on R&D for antibiotic discovery and bringing them into clinic. Antibiotics are something that has to be used with care and caution. There are examples of bacteria that are quick to evolve and develop resistance and there are a set of organisms that are not so. 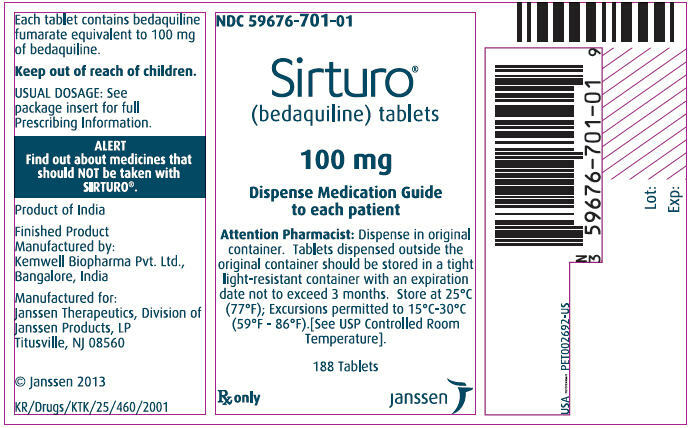 Also, there are multiple infections that are not life threatening and can be managed more easily in comparison to certain others that reuqire very aggressive treatment. From a marketing strategy point, R&D devoted to antibiotic discovery is based largely on companies own decisions which is based on multiple opinions. In other words there are no clear global guidelines on what needs to be really looked into. As Dr. Marie-Paule Kieny comments, "Antibiotic resistance is growing, and we are fast running out of treatment options. If we leave it to market forces alone, the new antibiotics we most urgently need are not going to be developed in time." Photo 1: Objective of global priority pathogens list (global PPL). The WHO was requested by its members to develop a global priority pathogens list which will prioritize the R&D for new antibiotics. For development of the global PPL, WHO put up a team of eight experts in infectious diseases, clinical microbiology, R&D, public health and infection control. Then, a multi-criteria decision analysis (MCDA) technique was used which allows to look into multiple alternatives, expert opinion and evidence-based data clubbed everything into one. The committee also decided to avoid organisms like Mycobacterium, HIV, malaria since they were already a priority at a global scale. Enterobacteriaceae members (Klebsiella pneumonia, Escherichia coli, Enterobacter species, Serratia species, Proteus species, Providencia species, Morganella species) that are carbapenem-resistant, 3rd generation cephalosporin-resistant. The panel has also noted that the above list is not the ultimate and there are a couple of limitations. For example, the decision of above overlooks that High-quality data is missing, especially for community-acquired infections and from low-income countries. The data is intended to be seen as a guideline for what is the pressing need. Mr Hermann Gröhe says, "We need effective antibiotics for our health systems. We have to take joint action today for a healthier tomorrow. Therefore, we will discuss and bring the attention of the G20 to the fight against antimicrobial resistance. WHO’s first global priority pathogen list is an important new tool to secure and guide research and development related to new antibiotics."